The MTU Nordic Ski Team invites you to join them for a fun and family oriented race and community ski series on our Michigan Tech Trails this winter season! The series runs on Tuesday nights starting at 6:00pm. What is the Citizen's Night Series? 2.5km & 5km mass start race &/or fun ski with your family and friends under the lights of the MTU Tech Trails! 2.5km & 5km loop will be same through the series so you can measure your progress through the season! Skier option of skate or classic, the choice is yours! Course marking and timing provided by the MTU Nordic Ski Team coaching staff & student-athletes. Grooming provided by MTU Tech Trails Facilities Manager – Scott Jackson & staff. Prizes! Best improved times male and female (age groups and overall) from start of series to end of series receives fun award (pasty, thimbleberry jam, MTU Nordic Team merchandise etc.). Minimum of two races of same technical discipline to qualify for prize and have to be present at last race series. Campfire social following all of the night ski series at the Tech Trails. S’mores, hot cocoa & blueberry soup! Adult equipment rentals available from Down Wind Sports & Cross Country Sports. Youth equipment use is available for free for the Citizen’s Night Series, sponsored by Copper Country Ski Tigers & Nordic Rocks Project. Visit Michigantechrecreation.com/trails/forest/index for more information including facts and trail statistics, trail maps, trail cams and everything you need to know about the Tech Trails. 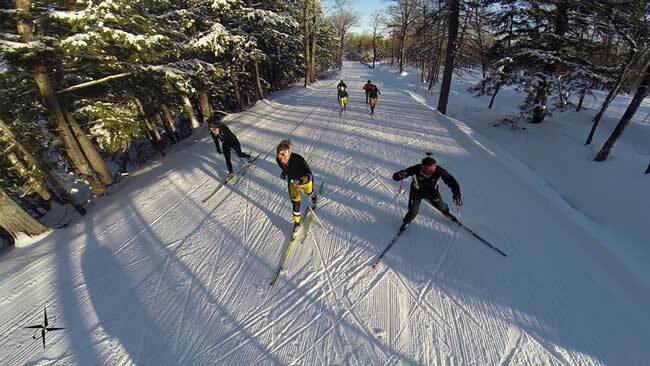 1x Citizen Night Series event to be held at Swedetown Trails hosted by the Swedetown Trails Club & MTU Nordic Ski Team! We hope to see you at the Tech Trails Citizen's Night Series this winter! See https://www.facebook.com/events/944939775655671/ for more information and any changes.